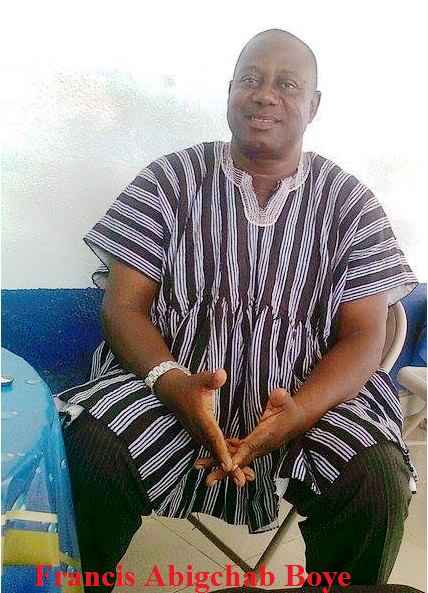 The retired Banker and once a Gbewa United -Tamale football legend and referee- Francis Abigchab Boye has died in Accra at the age of 62. He enjoyed listening to Radio and monitoring socio-political events on TV, loved visiting friends, associates and family members. Francis was a devout member of the Presbyterian Church and a branch secretary of the main opposition party- New Patriotic Party (NPP). Francis came to world on 23rd of September 1952, at Chuchuliga, in the Upper-East Region of Ghana. 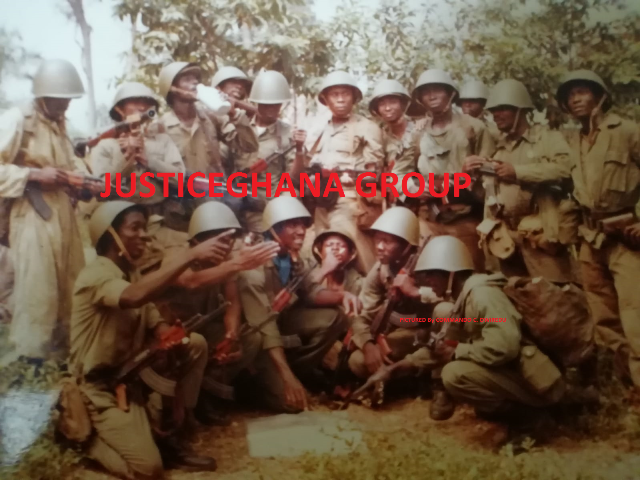 He grew up in a humble family background whose preoccupations- police service and petty trading, took him to various parts of Ghana- notably, Tamale, Takoradi, Koforidua and Accra. He is the eldest of the five children of the late Sergeant Abigchab Boye- who joined the Gold Coast Constabulary in the 1940s & Madam Madaga Adabu-Boye. Both parents were called to glory in April 1999 and April 2011 respectively. Young Francis Abigchab, began his early education at Chuchuliga and continued at Business Secondary School (BISCO), Tamale. He went on to study series of banking courses in Ghana. The Man Francis, whose early profession began as a footballer and a referee, became also a Senior Accountant, working among others, with the Bank of Ghana, Golden Beach Hotels, Lapalm-Accra, and Busua –Takoradi. He was an elder at the Presbyterian Church. Due to his professionalism, hard-work, active participation in community, politics and his undying willingness to serve almighty God and mankind, Francis became the friend of many, irrespective of their beliefs and backgrounds. He carried to his dust immeasurable Generosity, Humour, Affability, Care and a great sense of Love and Empathy. When Mrs Rebecca Korkor Boye tied her destiny with Francis in 1989, she quickly realized that she had met an ideal, principled and God-fearing man. That realization has been abundantly verified as truth and thorough over the years. Francis sided with the weak, the poor and wronged. He lovingly and cheerfully gave alms. With loyal heart and with the purest hands Francis faithfully discharged all family and public trusts. He is described as a true patriot and a family man who doesn’t just look around and see things that need attention. He was adaptable and approachable, takes action and solved problems that need to be solved. He was a prudent banker, a man of unbending integrity, a true and loyal husband, father brother, friend and associate. As a banker he was able to look at issues from social perceptive- always mindful of others' reactions and understanding why they react as they do. He actively looked for ways to help people. With his critical thinking abilities combined with application of logic and reasoning to identify the strengths and weaknesses of alternative solutions, conclusions or approaches to problems, Francis was seen not only by clients as a brilliant and wise banker but also as a trusted counsellor in his community. As the Boyes put it, with Francis’ passing we lose his positive attitude for life and outgoing personality which made him loved by everyone who knew him. “As an eldest son, he was our role model and we are happy to listen whenever he had advice for us. Francis was always there for the family when we needed. We will miss him more than words can say. We are blessed that we got to spend so much time together and were so close. We’ll miss Francis dearly and never forget him. His memory will live on in all of us forever.” Francis was pronounced dead of cardiac arrest, at Ridge Hospital, Accra, on Wednesday, 10th December 2014. With the passing of his parents, Francis assumed the headstone of the family Boyes-little, it is said, did the family know that he will soon be shaken and blown away at a relative age of 62. 2 Timothy 4:6-8 [New International Version (NIV)] “6 For I am already being poured out like a drink offering, and the time for my departure is near. 7 I have fought the good fight, I have finished the race, I have kept the faith. 8 Now there is in store for me the crown of righteousness, which the Lord, the righteous Judge, will award to me on that day—and not only to me, but also to all who have longed for his appearing.” To contextualize this with the poem below, we might agree that the loved and loving husband, father, brother and friend, climbed the heights of faith, and left all superstitions far below him. You play the biggest part. Will go right back to you. Why we’ll miss you Dad. *Mr Francis Abigchab Boye (born 23/09/1952), attended BISCO, Tamale (1970-1975), joined Bank of Ghana (1975-1989) and LaPalm- 2000-2008. He widowed: Mrs Rebecca Korkor Boye; two (2) children- Mrs Belinda Frances Awenlieh Boye-Awonor and Mr Francis Boye Jnr. ; and three (3) grandchildren- Amanda Akorfa Akosua Awoonor, Alvin Dzidzor Kojo Awoonor and Tennie Analeh Opomea Abigchab Boye. *SIBLINGS- six(6): Chief/Superintendent of Police (CSP) Abigchab Boye(Rtd), Anthony Alhassan Boye (United Kingdom), FUSIENI Tugah BOYE , AssistantSupredentent of Police (ASP) J.J Boye (Crime Officer, Adenta District Police), James .A. Boye of Ghana Education Service (GES), Chuchuliga –Upper-East Region, and Gloria A. Boye of Ghana Health Services (GHS), Nalerigu– Northern Region. *NEPHEWS: Ceaser Akatere, Don Azong Boye, Mandella Atengka Alandu, Godwin Alando, Prince Boye and Jese Awen Boye. *NIECES: Roberta Ayicbadic Boye-Sittie, Donna Azongley Boye, Laura Hassana Boye, Loula Fuseina Boye, Rose Alando, Priscilla Alando, Portia Alando, Patricia Alando and Winfred Alando. *WAKE-KEEPING: FRIDAY 30th of JANUARY 2015; TIME: From 6PM Till the following Morning VENUE: At the DECEASED HOME: KASOA, BEHIND THE 2ND FILLING STATION, (UNIVERSAL OIL), WINDY BAY STREET, OFF KASOA-WINNEBA ROAD, CENTRAL REGION. * BURIAL/RECEPTION: Saturday, 31st of January 2015, at deceased residence- Kasoa, behind the 2nd filling station (Universal Oil ), Windy Bay Street, off Kasoa -Winneba Road, Central Region. *CHURCH SERVICE: There will also be a Thanks-giving church service in Kasoa in his honour on SUNDAY, 1ST FEBRUARY 2015, at the UNIQUE GRACE PRESBYTERIAN CHURCH, Kasoa –Cp. All sympathizers and well wishers are cordially invited. Until his untimely passing, places that Francis lived or resided included Korle Bu, Osu, Mamobi and more recently, at Kasoa, in the Central Region.